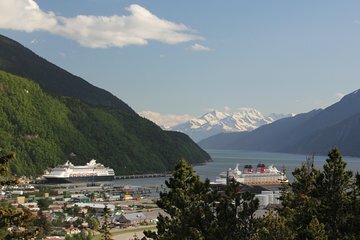 Explore Skagway without the hassle of planning on a tour with convenient transport from the Skagway cruise port. Your guide, who navigates for you, stops at top landmarks and secluded locations off the beaten path, from Bridal Veil Falls to a Robin Williams film location. Throughout the tour, listen to little–known anecdotes about the area’s history and enjoy plenty of frame–worthy photo opportunities.